Stories from our town make up a fabric of daring adventures and daunting work. Pioneers to the river bend built the town with wood in the 1820s. The next generation built the city with coal in the 1880s. The automobile came to Kansas City at the turn of the 20th century and gasoline helped it stretch out of city streets and create suburbs in the 1920s. The entire 20th century was about giving gasoline its head, so to speak, while we enjoyed its many gifts. Now the future has arrived. Shall we continue to adore gasoline or face the hard choices of alternative energy and communication? 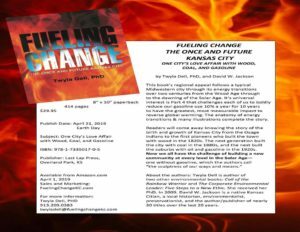 Twyla’s new book, “Fueling Change: The Once and Future Kansas City,” will be available for a special price of $20.